If you are familiar with Discommon, you’ll know that our primary work is as a design firm and we use our “Discommon Goods” products as our creative playground where we can flex and hone our skills. These have been a real challenge for us, but a lot of fun. 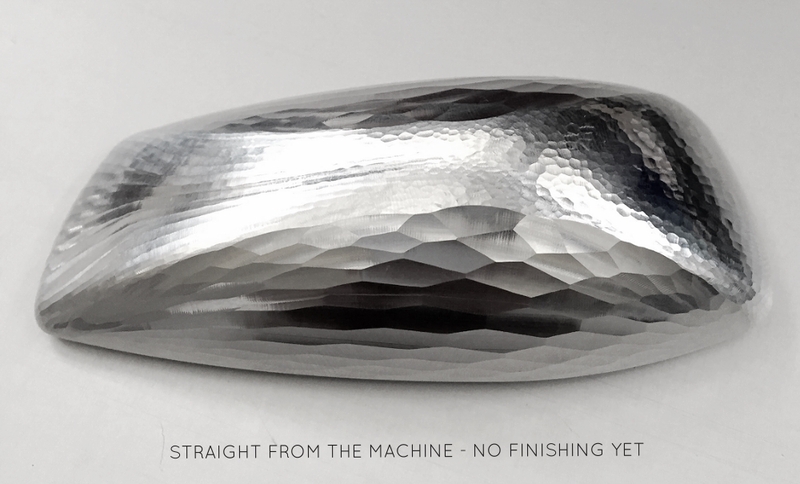 The linear machine lines over the faceted body were tricky in titanium. Titanium is “gummy” as a material so we really had to dial in the machining process. The leather was in theory, simple, but we are folding an organic material over a 3D form and hoping that sub-1mm laser cut leather holes line up with machined holes in the titanium. They didn't, for a long time. Hix Design work with our CAD team to dial in the laser cutting profiles and then hand stitched the leather as they do with all their work. We think you will love the tactile feelings you get holding these pieces - grip from the texture, silkiness from the coating, softness from the leather and a nice little thumb recess to allow you leverage on your favorite beverage.